Grapes of Passion » A Passion for Great Food and Great Wine! Premise #1: I submit to you that a prepared dish should never be the same twice. Consider the analogy of preparing food to producing a work of art. Each preparation should be unique and have its own sense of individuality, so that when you sit down to relish the final product, you should feel a sense of expectation and adventure. You will be able to find this uniqueness though many means… How large of a portion are you preparing? What seasonings to add and how much? How is it being heated; pan, oven, crock pot, grill, convection? Is it covered or uncovered. What will you be serving along side the main entrée? What have you envisioned for the final “presentation” of the dish? What wine will you pair with the food? Don’t be afraid to experiment! Written recipes should be “guides” to get you started, but feel free to make whatever changes you see fit. You and your guests have your own distinctive tastes in food and wine, so make selections that are pleasing to you! And, as an additional note, it is not required to head to the grocery store to attain exactly those same fresh ingredients every time you create your favorite recipe. We all have busy lives. Sometimes, it is necessary (and fun) to throw in whatever ingredients we have available at the time. You may just invent something entirely new! Premise #2: The key to success (in cooking, wine tasting or otherwise) is not derived on how much you know, but rather how willing you are at finding out what you don’t know. I guarantee that every person on this Earth knows less than one percent of all there is to know. And, this includes only that knowledge that we can measure…that which has already been learned. It does not begin to calculate the vastness of what is yet undiscovered. Of course, knowledge itself cannot truly be measured. So, will a person that knows a lot in a specific field of expertise succeed over time if they don’t feel the need to continue to learn? Perhaps, for awhile. But, it is the person “willing to learn what they need to know when they need to know it” that is most likely to truly excel in the long run. 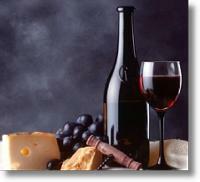 Perhaps more so than any other area of specialty, food and wine are unlike many of the constants in our world. They are ever-changing, evolving, and in many ways completely dependant on the individual tastes and preferences of end-consumer. Wine in particular, perhaps more than any other food product, can show tremendous variation from region to region, vineyard to vineyard, and vintage to vintage. It is up to us to remain flexible, learn, and adapt to their ever-changing qualities. Premise #3: No matter how much we know and how good we get at what we do in life (jobs, food, wine, or whatever), we will never achieve absolute expertise. It is a lifelong process…ongoing…never complete. In that spirit, I bring forth my work to share with you, not as an absolute authority in the fields of food and wine, but as an “amateur” chef and connoisseur…one always learning…always changing…one with a passion. And, as you too are endeavoring to excel, whether creating wonderful works of art in the kitchen or sampling some of the most succulent wines in the world, always remember this…”it is the journey, not the destination” that matters. Enjoy it! We absolutely embrace your philosophy and share your passion for food and wine…always learning–and having fun with it! Stop by Life Lindstrom sometime-we have alot in common!